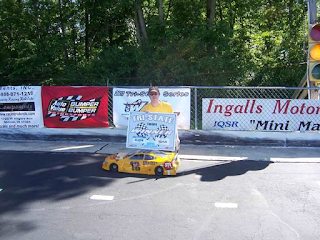 The premier Quarter Scale racing series in America began the 2017 season at the tight quarters of Ingalls Motor Speedway in Ingalls, Indiana. 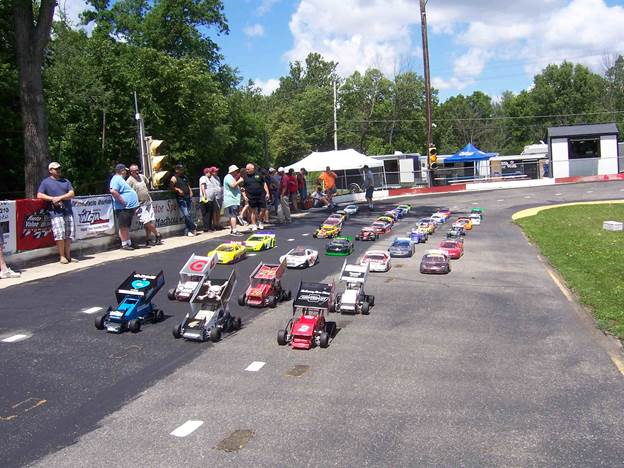 The little track known as the “Mini Madhouse” and the Indy Quarter Scale Racers with Jason Cook at the helm, along with the community of Ingalls provided a fine facility and first rate hospitality for racers who gathered there this past weekend to contest 4 racing divisions with a total of 40 cars. While rain prevented most of Friday’s practice, by late afternoon the showers gave way to partly cloudy blue skies and the track got busy for the rest of the day. Saturday’s forecast was most pleasant and came true to allow a full day of racing. Saturday began with a couple of practice sessions and then went into qualifying to set the line-ups for the heat races. And the Winner’s are! Sprint Car, JR Parsley, Limited Sportsman Scott Rance, Sportsman Matt Hilber and ECM John Wachter. Top qualifiers for the day were Chris Hogue in Sportsman, John Pipchok in Limited Sportsman, and Todd Holloway in both East Coast Modified and Sprint Car. The first main of the day was the Sportsman “B” Main. The top six qualifiers in Sportsman were locked into the “A” Main. The other 10 Sportsman racers had 75 laps in the “B” Main to decide which four of them would transfer to the Sportsman “A”. At the end the four transfers would be Greg Hilber, Tony and John Watcher, along with Walt Arthur. 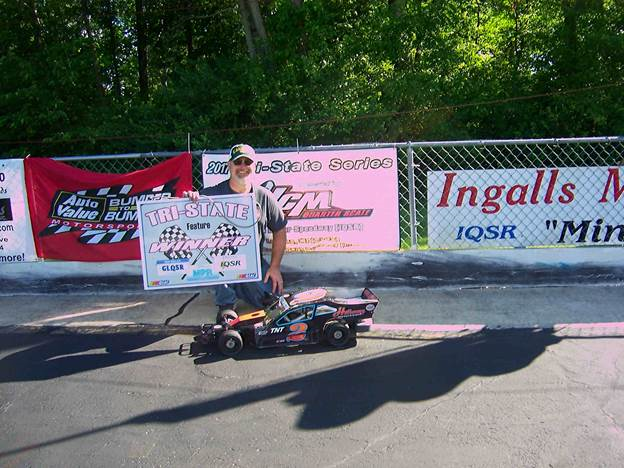 Sent home were John Foster, Jason VanHise, Gabby Allshouse, Gary Mouser, Paul Haas and Tim Sunde. The first of the “A” Mains was the Sprint cars for 100 laps around the very fast Madhouse oval. 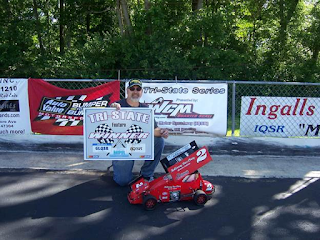 TQ Todd Holloway led the field to the green and the race was on. The Sprint car heat races were very competitive and the early stages of the “A” exhibited similar closeness. Larry Hopson made it to lap 21 before he withdrew due to engine issues. Larry explained in the pits that “It sounded and felt like I was dropping a cylinder.” With a one cylinder engine, we all know that makes racing tough. Larry thought it best to drop out, salvage all he could for his Medewa Farms #0 sprinter, and focus on the QSAC NCS race coming up at Clover in July. The Sprint cars came to their mid-race fuel stop with Holloway leading, J. R. Parsley in 2nd, and “Big” Mike Little in 3rd. Kevin Ligon was struggling a bit with his #4 ride and fell a lap down soon after the fuel break as leader Todd Holloway set a torrid pace opening a large lead and closing in on third place “Big” Little to put him a lap down. Little was able to put a lap on Ligon and Holloway got by Ligon for another lap but could only get close to Little and not get by to down the “Big” Little sprint car. 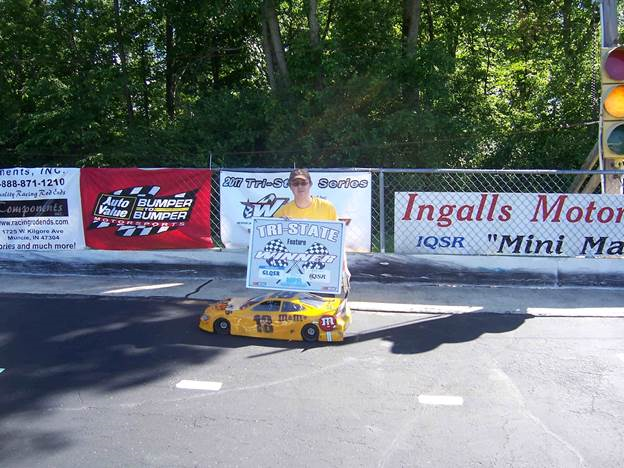 Holloway took the checkered flag and the glory that goes along with a visit to victory lane at IMS. The Limited Sportsman “A” main had a good set up from the heat races where Scott Rance showed power, speed, and whoops. Rance was the dominant car in the heat races and had one on them all but won when he over drove the third turn on the tight track and allowed Pipchok to get past for the win. Hmmm, a sign of things to come, perhaps? Rance was the top qualifier, Pipchok 2nd, and Earl Clement 3rd. There was a bit of on the start as one driver got some right front damage and headed to the pits for assistance. He got straightened out and the race was on with Rance in the early lead and hung on through a few re-starts for single car spins (Race director Jason “Cookie” Cook did a fine job all day of calling yellows when things went amiss on the track, preventing many collisions). Pipchok was able to stay close in 2nd until he got into the #28 stocker and spun him in turn 2. Pipchok to the rear and Chris Stump in the #54 to 2nd and hot on Rance’s heels for the remaining laps to the fuel stop. After the fuel stop, the field was down to six cars, one of which was John Pipchok who was working his way through the light traffic to get back to the front. Dave Abrams, Orrin and Steve Sunde, and Joe Atkins were done before the 50 lap fuel stop. 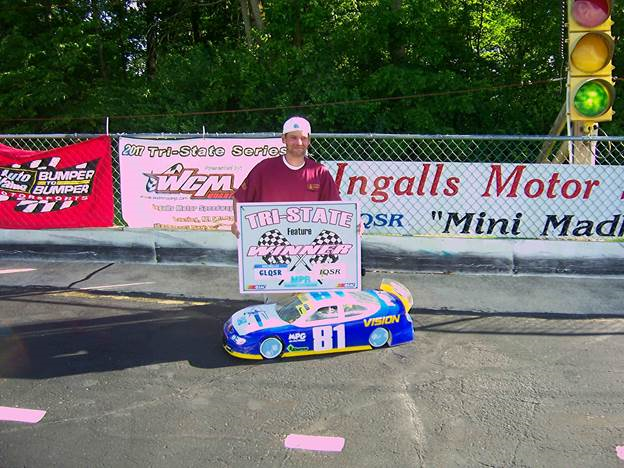 On the restart, Rance showed muscle and skill taking his brightly colored car to a lead of 1/3 of a lap, but then Earl Clement spun and the filed closed up on Rance who faced another re-start. After the green came back it was Rance, Pipchok, and Clement, followed by Stump who began to fade. Chris Stump, who is a regular competitor at IMS won his first Main here last Saturday, and qualified a solid 5th for today’s contest, but would not seem the smile for Lady Luck on this day as he got caught against the wall on the back stretch with 18 laps to go and had to retire with a broken heim. Its Rance and Pipchok on the re-start. Rance hangs on and Pipchok hangs tough, not letting Rance get away. With 8 laps to go John Pipchok is all over Scott Rance and then, just like in the heat race, Scott goes into the turn a little too hard, slides up the slight banking on exit and John capitalizes to take the lead which he defends against Scott to the checkered flat. John commented after the race that he was glad that he had a “long run set up with a short run gear” in his #18 racer to take the win. On to the Modified “A” Main for more great racing on this beautiful afternoon. Todd Holloway qualified top of the field with Tony Watcher 2nd and Keith Barnes in 3rd to lead this great looking field of hot rods to the start. Walt Arthur and Jason VanHise did not answer the call for the start. Todd Holloway, still high on his win in the Sprint Car “A” Main took the green and the early lead in this 150 lap rounder and was fast, very fast, and fast loose. So loose that on the first few laps he negotiated turns 1 and 2 as if he were driving a dirt modified as he “dirt-tracked” it through the corners. It was working for him and he and Tony Watcher pulled away from the rest of field. With few yellows it wasn’t a long time but it was many laps when Todd began put distance between himself and Tony. No shame on Tony as Todd was just bad fast and got into lapped traffic. The traffic did play to Tony’s advantage a bit as he fared better at negotiating it than did Todd and was able to close the gap a bit on Todd. Then a yellow closed the gap completely and Tony would have his chance to get Todd. Tony was able to stay close after the re-start and heading toward the fuel stop, but just before mid-way, Keith Barnes blew a shock mount and tested the wall in turn #1. The wall won. Keith admitted that he noticed a problem a couple of laps prior and was not surprised by the end result. Chris Dimascio got himself sideways, turned around, and frustrated on lap 67 ending his day and race earlier than hoped. But, Chris being Chris was still smiling as he stood in his pit after it all. Chris started and ended in 5th. Back on the track, Holloway was giving spin out demonstrations and then having to deal with traffic as he worked his way back to the front. At one point, Todd got help up behind two of the Modifieds doing battle and Tony was able to pull away. But, cream always rises to the top and Todd got back in front with Tony staying close until Tony lost his left-rear wheel. Tony was done, and Todd put his Mod on cruise to lead John Watcher to the finish. The last laps of the day belonged to the Sportsman division. Sixteen entries had been whittled down to a fast field of 10 to settle the matter over 200 laps on the semi-banked asphalt surface in the late afternoon. On the pole for this thunder fest of 2-cycle powered tire eaters to defend his home track would be Chris Hogue, followed by Matt Hilber, and John Cibella. This very fast and highly completive group of great looking stock cars took the green to begin the finish. A great battle for third took seed almost immediately and Nick Ellis ended up against the wall in turns 1 and 2, but was able to continue and did resume the battle for third on the ensuing restart. Nick Ellis was fast and smooth all day. Watching him work his way through the heat races was a pleasure. Matt Hilber was pressing Chris Hogue hard in the early laps and through a restart after a yellow for a single car spin near the back of the pack while the battle for third resurrected and again sent Ellis to the wall, but at the other end of the track in turns 3 and 4 this time. After these thunder ponies got back up to speed Greg Hilber moved into third for a short time before John Cibella passed Greg back. Great racing between those two, as well as up front between Hogue and Matt Hilber. Matt was like a moody dog on a fresh bone as he pursued leader Chris Hogue and on lap 65 Matt took the bone passing Chris in turns 1 and 2 with a smooth move and power off of turn two to seal the deal and make the pass stick. It was not long until a restart gave Greg Hilber a chance to peek inside and pull up on Hogue’s fender, but Greg’s speed and momentum caused his tires to let loose of the asphalt just enough to get him into Chris and both of them got sideways which put another car into the wall. Greg went to the rear but was back up to 5th by the next yellow, and at the 100 lap half-way mark it was Matt Hilber, Hogue, Dave Raber (Surprise!) and Greg Hilber (No surprise). The second half of the race begins with Greg holding Dave Raber in his sights. Dave ran a good, patient race to get to 3rd, but Greg seems to think that is not enough and disposes of Dave within 10 laps to get back to 3rd place. Matt Hilber is able to open up leads of a straight away on Hogue, but then Hogue gets back to Matt and the two play a little game in that if Matt runs a high line, Hogue runs lows. Them Matt comes down on the track and Hogue goes high, but nothing they do changes the running order. As we get down to the final 75 laps, there remain 8 cars in competition as Nick Ellis and Steve Riddle have succumbed to misfortune. Steve Riddle was fast all day long as demonstrated by his 4th place qualifying for the Sportsman Division, and he drove a smooth and consistent line for most of this laps. With 20 laps to go its Matt, Dave, and John Cibella stalking from the 3rd position. Seven laps later Chris Hogue has himself back to 3rd and is putting enough heat and pressure on Raber to soften my mother-in-law’s Sunday rump roast. On lap 192 Hogue gets by Raber and soon after John C. gets by Dave as well relegating Raber to a 4th place finish after getting more out his race than most could have. Matt Hilber takes home the Sportsman “A” Main victory with Chris Hogue in a hard earned 2nd and John Cibella in an award of merit 3rd place. This was some fine racing among some very talented drives in control on some very well designed, built and set-up cars. 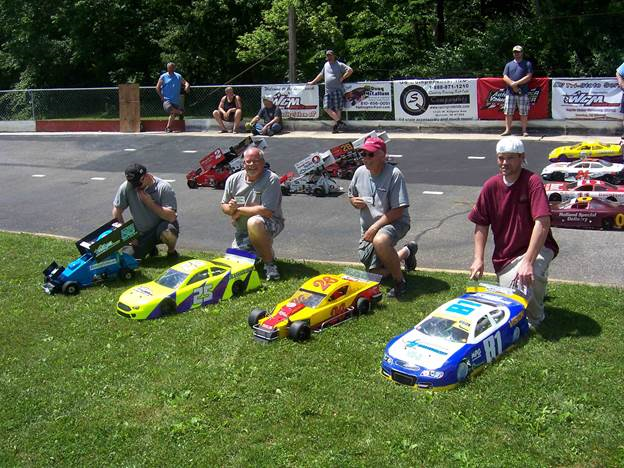 Quarter Scale Racers for doing such a wonderful job of hosting this event. 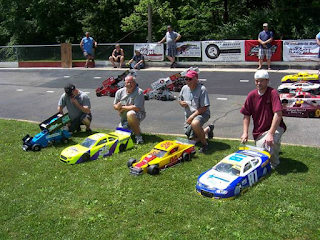 The 2nd leg of the Tri State Series is coming up on August 12 at FunTyme Park Raceway in Grand Ledge (near Lansing), Michigan, hosted by the Great Lakes Quarter Scale Racers. I can see that I am going to have to give Paul Haas a Contract Extension with a rise. I have happened upon the Greatest Quarter Scale reported any where’s. Thanks Paul for an unbelievable write up. Please don’t leave me.